Hope your Labor Day weekend was good! 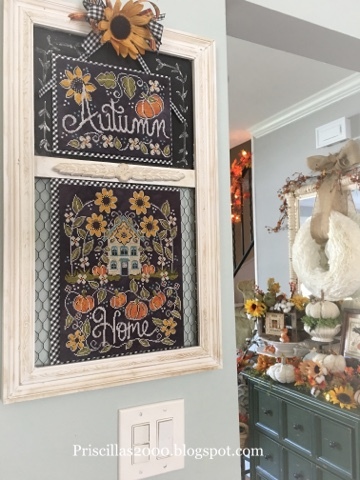 Sunflower Manor is my chalkboard to cross stitch collaboration between Hands On Design and Me! This design will be shipping to stores this week so call and preorder it! This is the 3rd in the series Tulip House and Rose Cottage came before this one.. 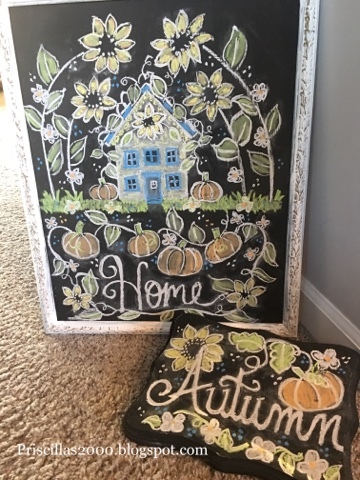 These are the chalkboards I drew that Cathy from Hands on Design charted the designs from. 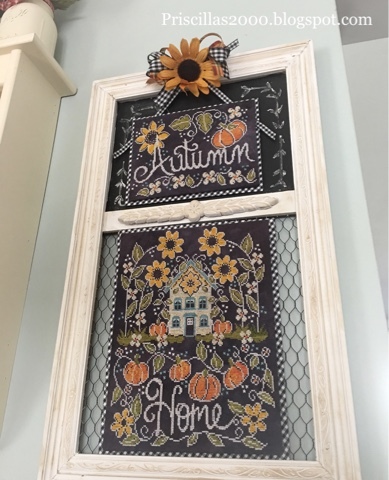 If you have followed my blog for a while you know that I Love pumpkins and sunflowers...So this would be the perfect house for me .. sunflowers bigger than the house and a pumpkin vines growing all the way up the roof and a whole yard of pumpkins ! I stitched mine on 28 count Monaco that I had purchased on Ebay from Garibaldi's fabrics. I think the color was Midnight. But the fabric was not dark enough ( it was more grey than black) so I used Rit dye and dyed it until it was more to my liking. I used almost the whole bottle on this piece. It looks straight up black in these photos , but it is black with grey .. Doesn't it look amazing in the updated frame ! 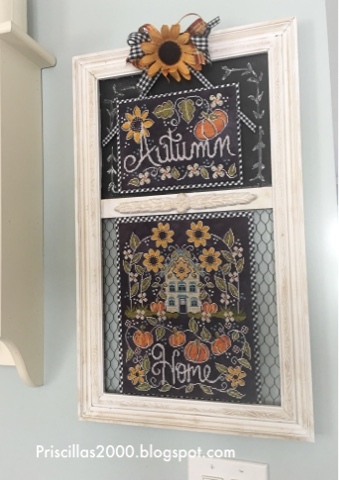 I use magnets and sheet metal on the back of the designs to change them out with the seasons ...Cathy does such a great job getting the chalkboard drawings into these designs ! I hope you all will stitch these and love them as much as I do.. and if you are on Instagram or Facebook tag me so I can see your stitching! another beautiful design. Moving to a new home in 2 weeks and can't wait to get back to my routine of stitching every evening. This will be on my list to stitch for sure! 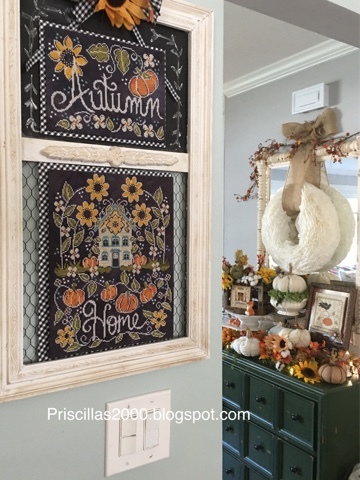 Looks beautiful Priscilla! Tell me please where do you get your sheet metal from? What do you use to cut it? I found the frame!! And ordered all of the seasons patterns available 😍😍any tips for stitching on black? Thank you for being such an inspiration!! !